It’s been an age since I have joined you here, but oh it’s nice to be back! As we all know, blogging is only a snippet of my life and it takes pretty much all of me to love my hubby and dear sweet lambs plus run our home and pastor a church. I have spent the first part of the year getting the tribe sorted and into the rhythm of our family / school / homeschool life and routine. The good news is that I am now resuming my weekly blog posts. 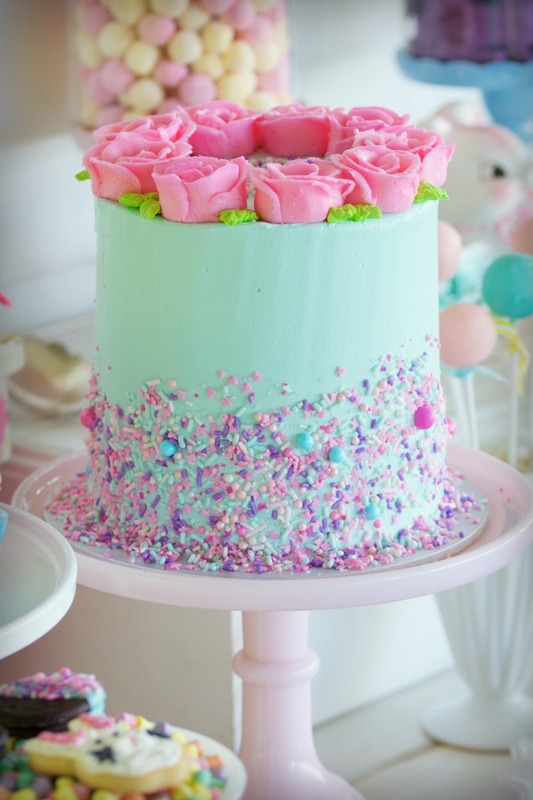 Every Saturday morning you will find my latest creative ventures, themed party, styled shoot or cupcake recipe. I hope you will join me. Despite my blogging absence, I have been quite busy creating new content and I can’t wait to share it all with you. 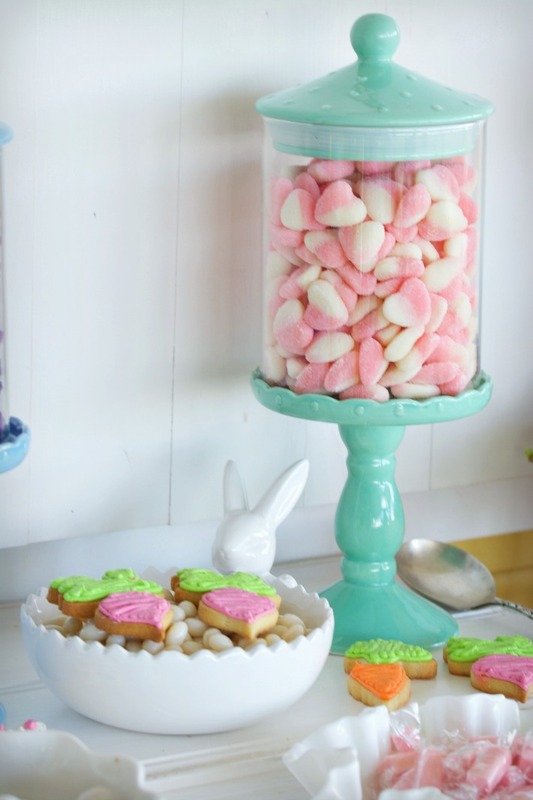 First up for 2018 is this Easter dessert table I set up for a flower crown workshop I hosted in my home. 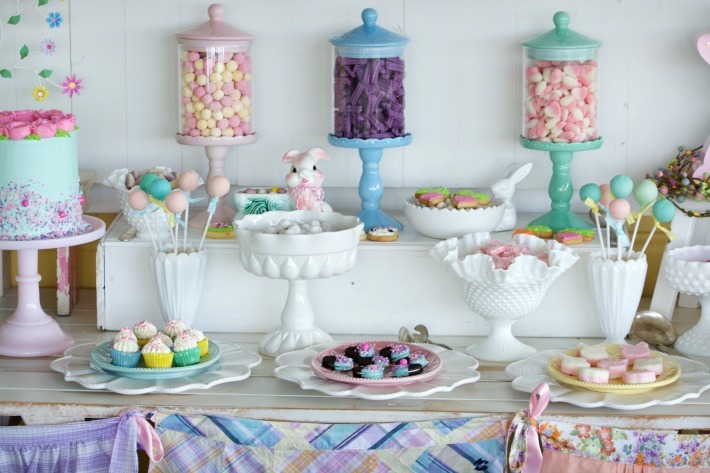 My goal was to create a pastel sweets table with a distinct vintage feel. 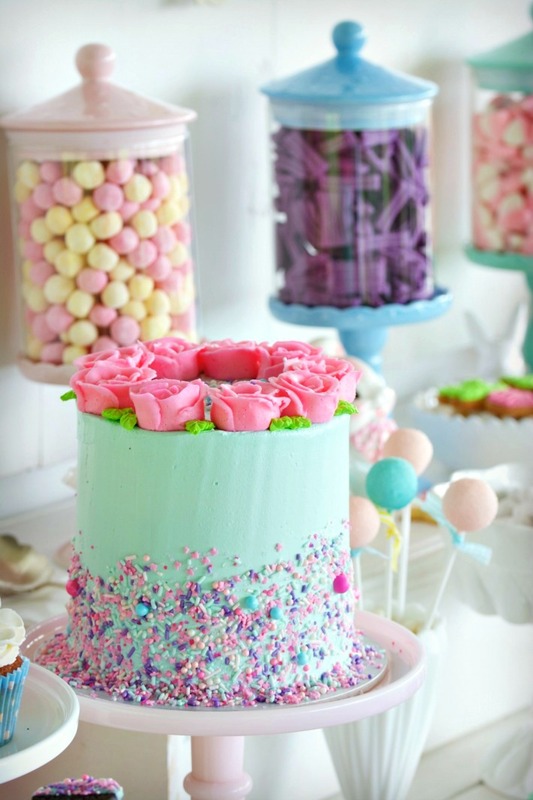 I wanted to draw out the child in each of us, with matching lollies, cookies, cake pops and cake. 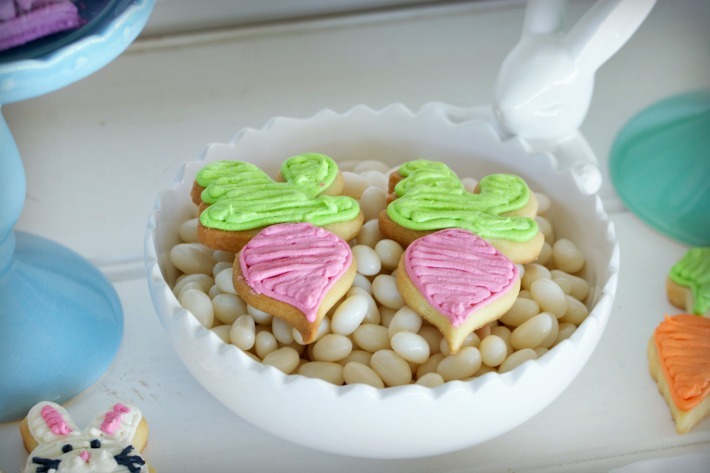 The girls and I got our bunny cookie cutters out to give homemade coconut ice an Easter makeover. I was pleased with how easy it was, and how cute they looked. 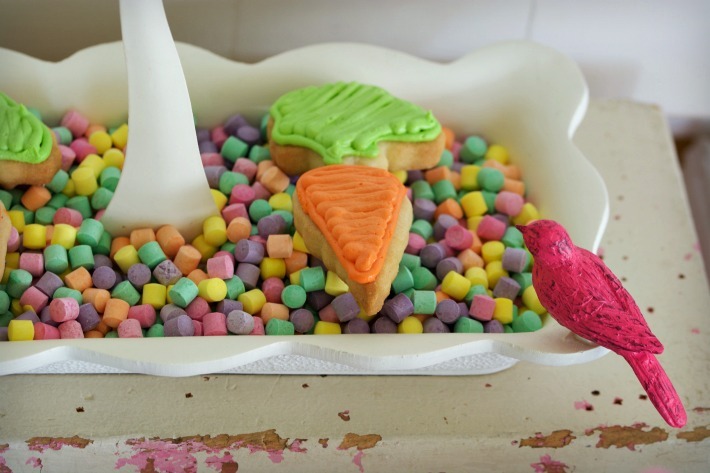 Even your toddlers could help in the kitchen with this one. Another super easy snack I made with the kids was choc dipped Oreos. We simply melted white chocolate (with a drop or two of candy oil colour, or you could use candy melts if you have a microwave, which we don’t). 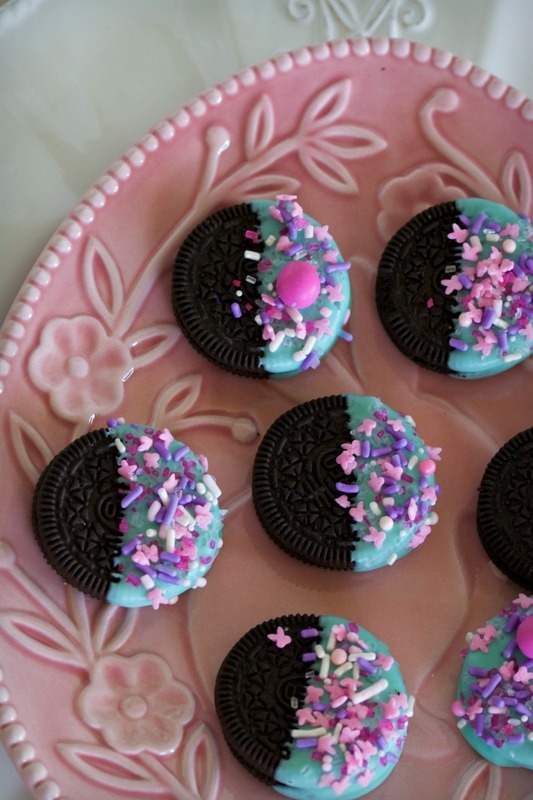 Dip half an Oreo biscuit into the chocolate and sprinkle with your favourite sprinkle mix. 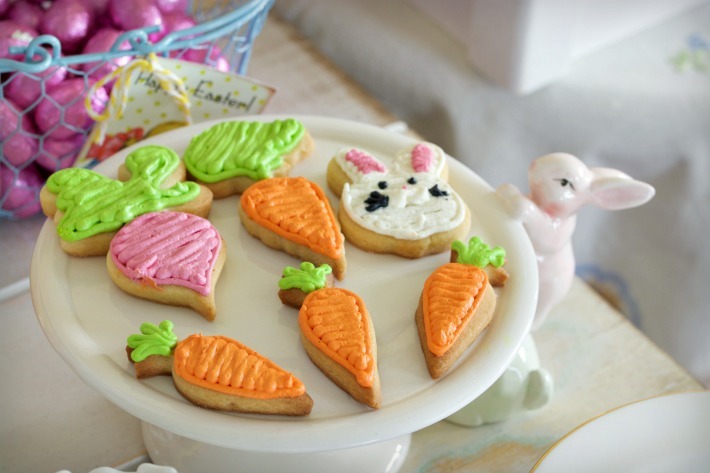 I’m not much of a cookie decorator, but I couldn’t resist these adorable radish and carrot cutters. 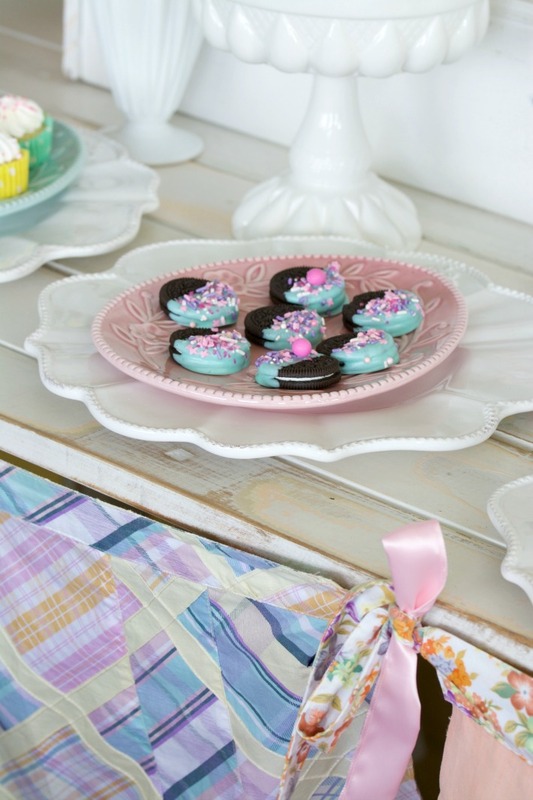 Piped with pastel coloured buttercream and displayed in cute Easter bowls and plates, they added a bit of Easter cheer to the table. 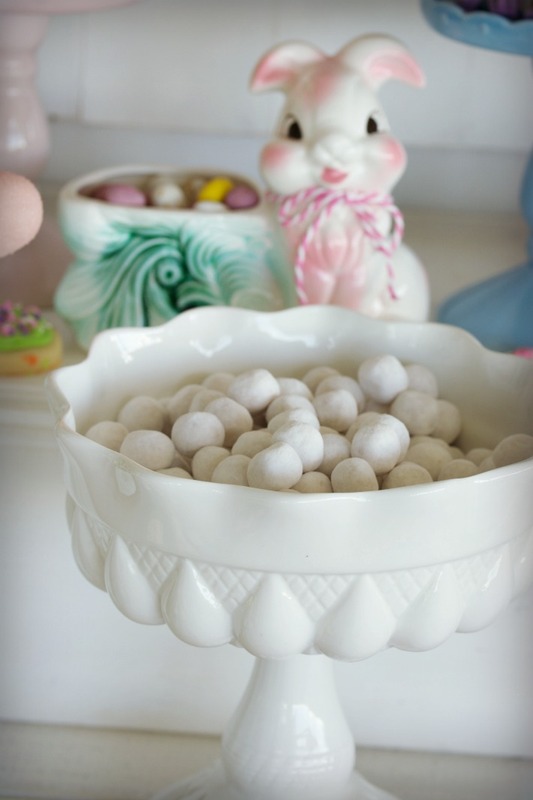 I love displaying sweets in cute little vintage planters, jars or timeless white milk glass dishes. They just look soo good all dressed up. Perhaps my favourite element of any party is the take home favours. 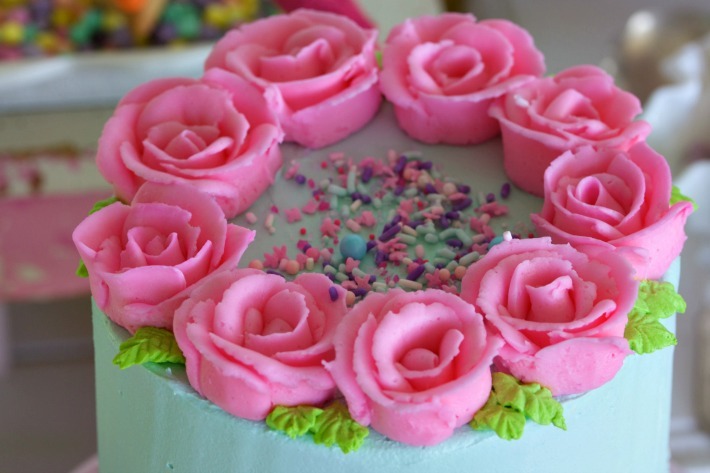 A gift giver at heart, I love to bless my guests with goodies to take home, which are preferably edible. 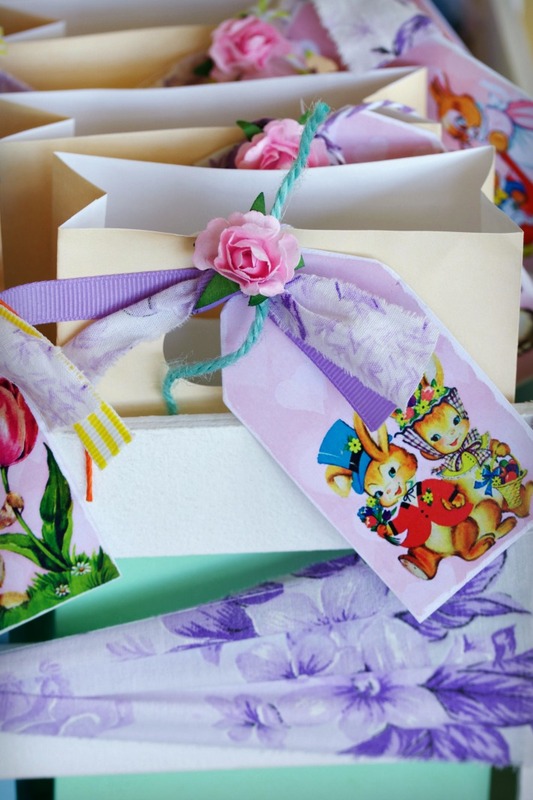 For my Easter party I decorated cheap gift bags with fabric strips, ribbon, paper flowers, string and cute vintage easter tags, for guests to put their lollies in. 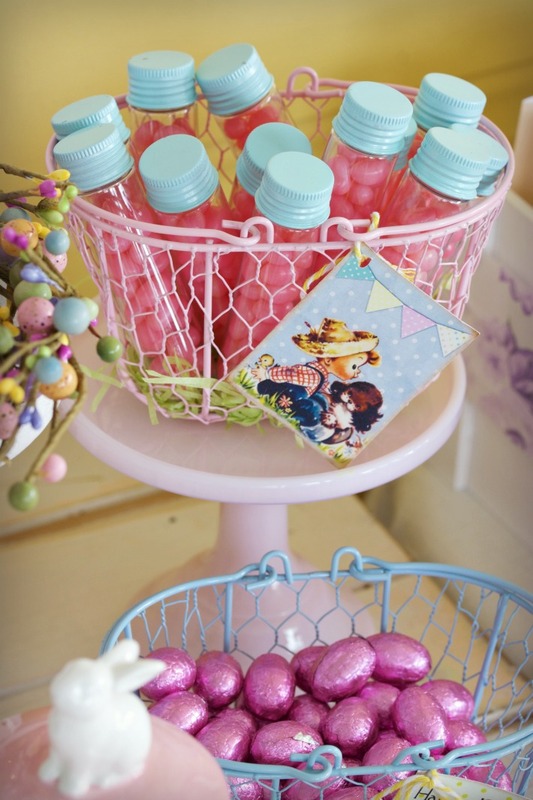 I also spray painted the lids of plastic cylinders and filled them with jelly beans for the children to take home. 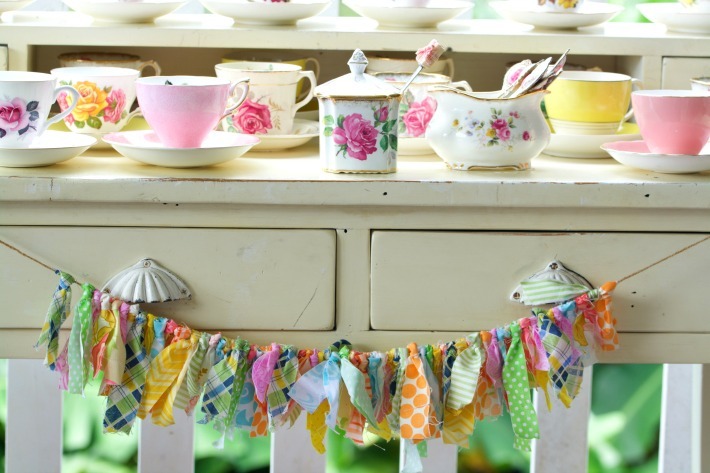 For the ladies I set up a tea station with my pretty tea cups on a white vintage dresser, decorated with a simple fabric bunting to tie in with the theme. 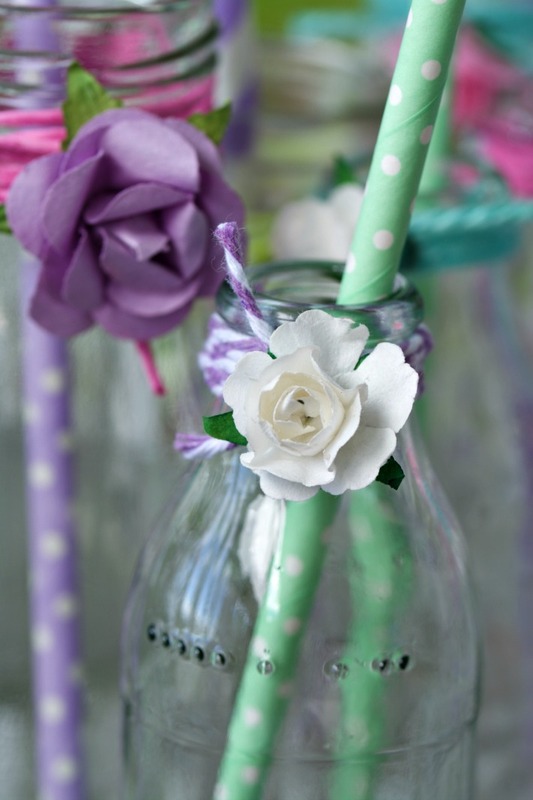 I also decorated glass milk bottles with string and paper flowers in pastel colours. 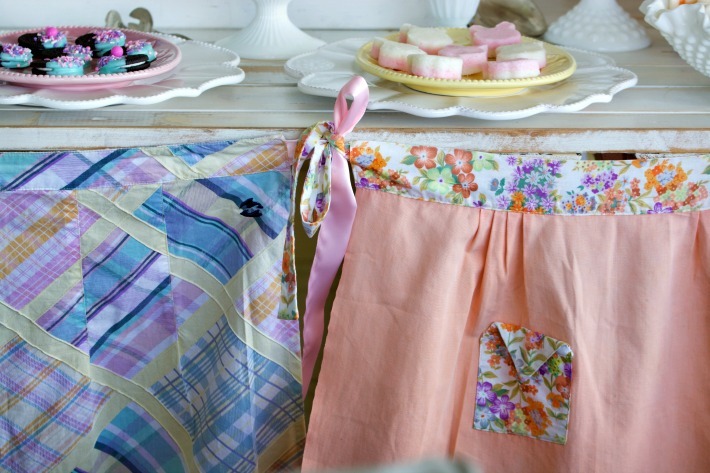 Another weakness of mine is vintage aprons. 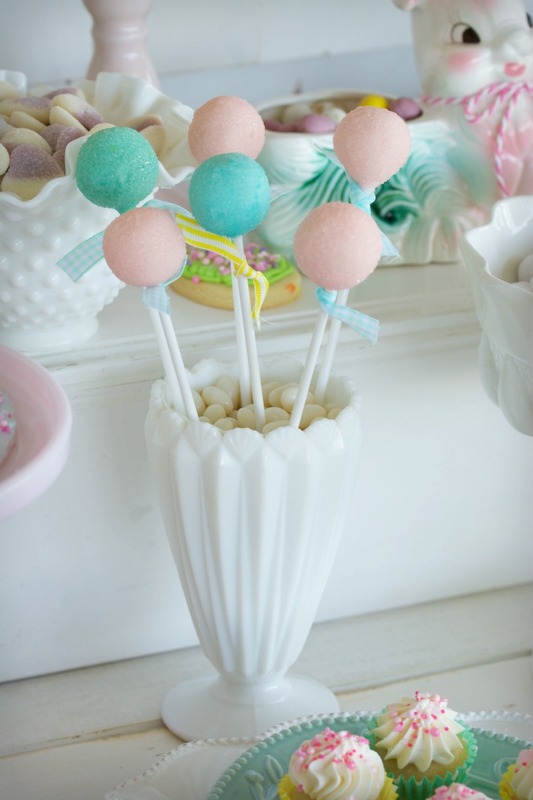 Oh my heart, they are just soo adorable and make the perfect decorating accesory! 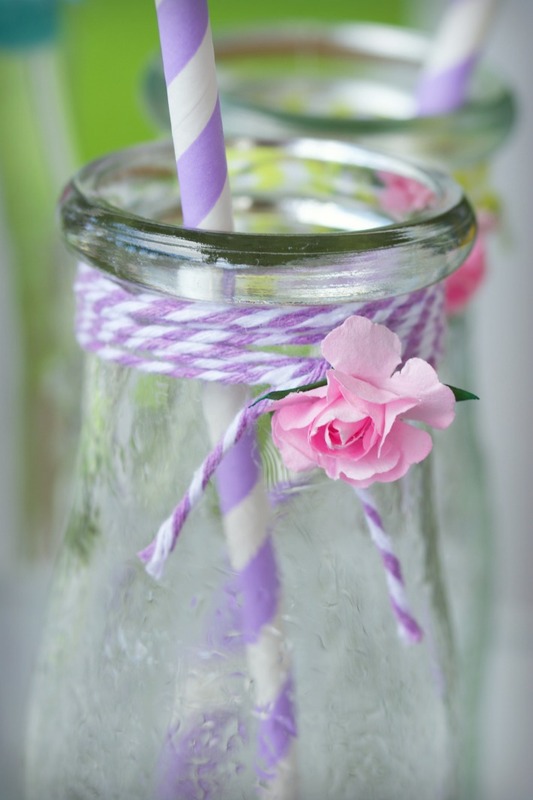 My favourite way to use them is strung across the dessert table as a garland, or even as a backdrop. 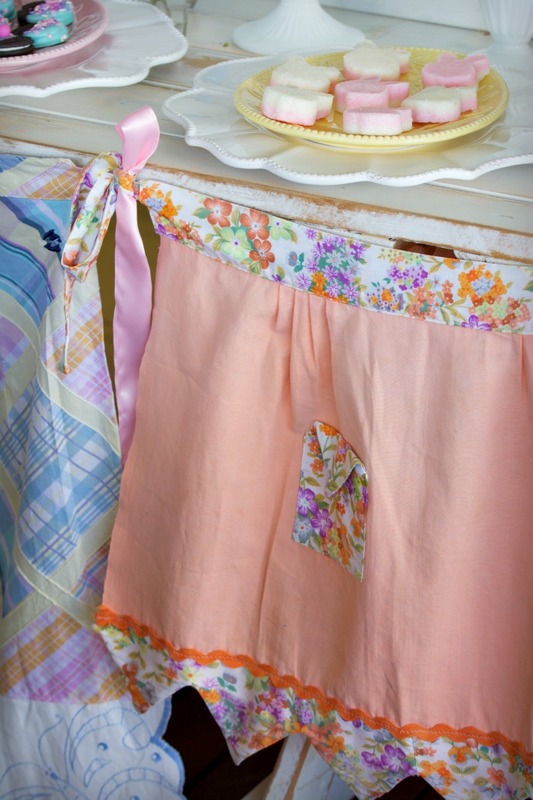 The colours are so pretty and I love that real women wore them as they cared and cooked for their families. A reminder of beauty in the every day. Thanks for taking the time to scroll through my photos. Hopefully you go away inspired to create your own Easter gathering with the kids, family and friends. I am so happy to be here. 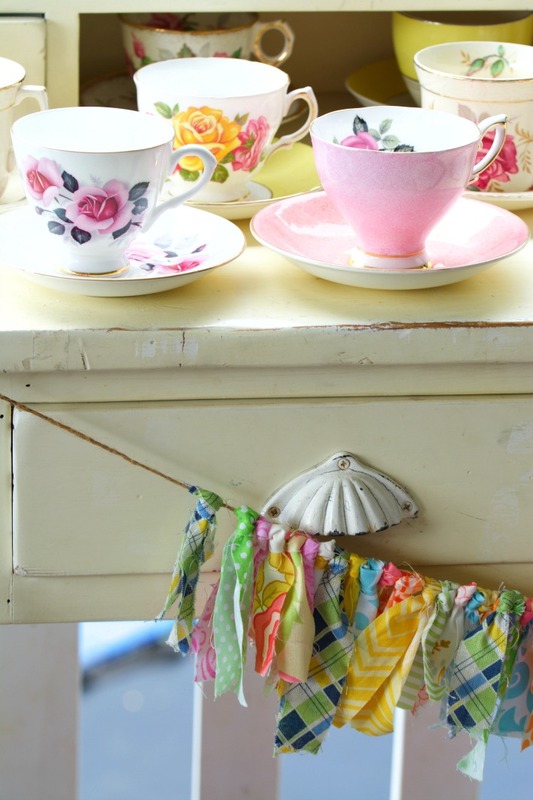 Life is pretty big for all of us, and I am so thankful for the tiny time and space I get to meet with you and share my passion for all things sweet, pretty and vintage. 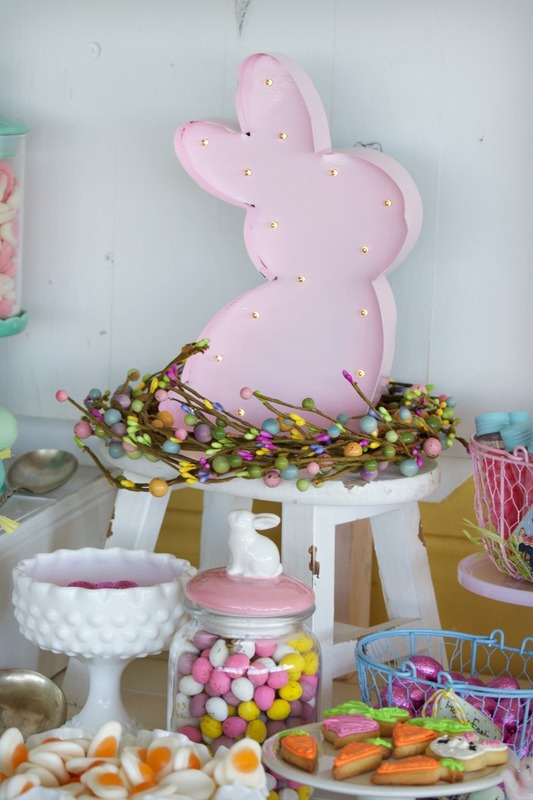 Stay tuned and don’t forget to pop in next Saturday morning where I will share with you my latest Easter photo shoot, which I am so excited about, I think my heart will burst! 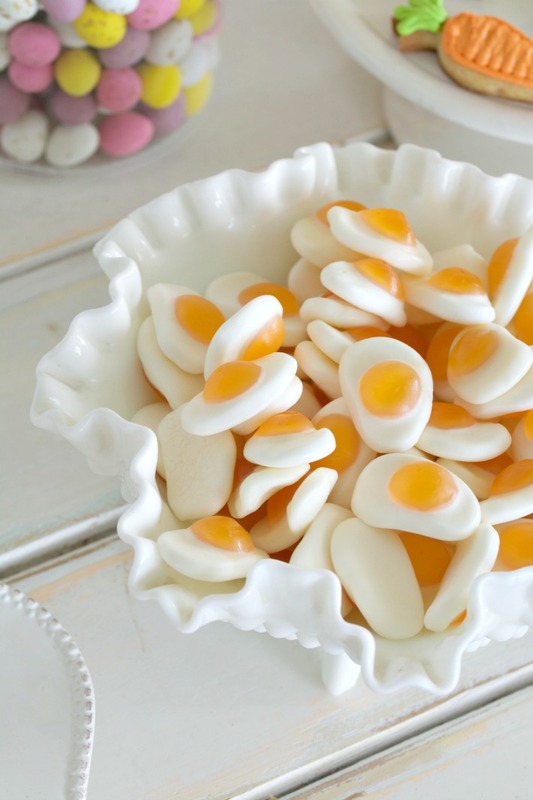 What a delightful Easter treat it would be to partake in your delectable offerings! A feast for the eyes as well as scrumptious! Thanks for sharing your lovely party photos, Anna! 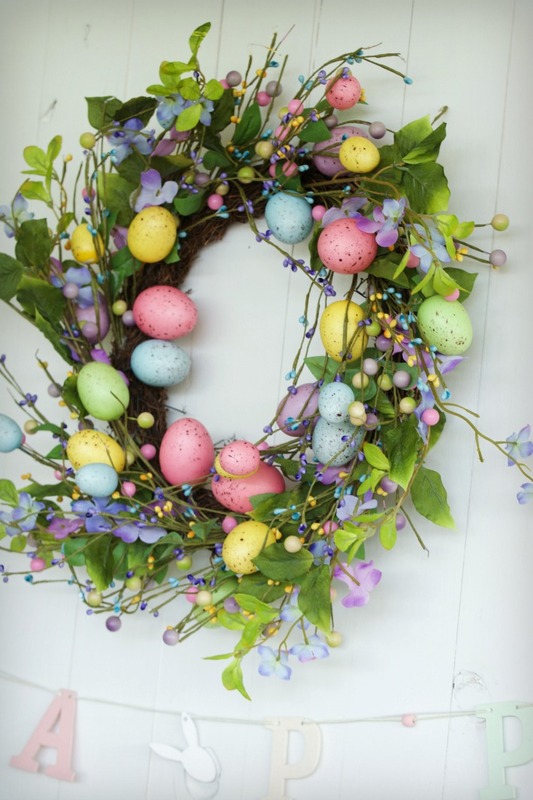 You’ve warmed my heart just seeing all your beautiful Easter treats and decorations. I wasn’t going to put out any of mine this year because we’ve just returned from holidays and for the first time ever I’m not hosting any Easter gatherings or having guests in our home but you’ve reminded me it’s the simple joy of seeing pretty colours and the smile it brings to your face. I’ll have to save all the baking and cookie ideas for next year but at least the bunnies will be out. Thanks for the boost I needed! Easter blessings to all your family.